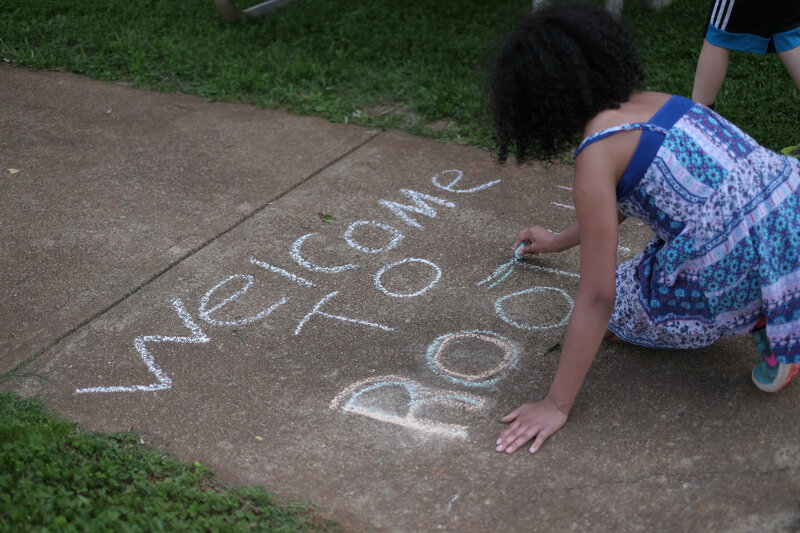 On April 27th, City Schoolyard Garden hosted Root! at Burney-Moran Elementary to honor and recognize the contributions of our partners in education and in the community. Those who have gone above and beyond in support of the gardens were awarded Golden Trowels and Golden Beets. The evening air carried springtime scents and music from local band The Old-Time Snake Milkers. Guests were treated to food and drink by such local businesses as Pearl Island Foods, Caribe Juice, Blue Ridge Bucha and Whole Foods Market. They were also treated to tours of the Burnley-Moran garden by enthusiastic students and members of the safety patrol. Everyone was impressed by how familiar the students were with the garden they’d worked so hard on, and the joy on their faces as they explained what they grew and how was obvious. The Golden Trowel Awards recognize both educators and community members for their equally valuable roles in maintaining the gardens. Garden Coordinators Rick Harden and Matt Darring introduced some of the amazing Charlottesville teachers who have taken on major roles in the gardens. Denise Pilgrim, who teaches first grade at BME, felt the love as she took the stage with several of her students, who cheered as her name was called. Another BME teacher, Kathy Umbdenstock, was recognized for the work she does with BME’s kindergarteners. Not to be outdone, Johnson Elementary had four of its teachers awarded – the entire kindergarten teaching team, Emily Branson, Lorena Caballero, Melanie Johnson & Jessica Sokol. 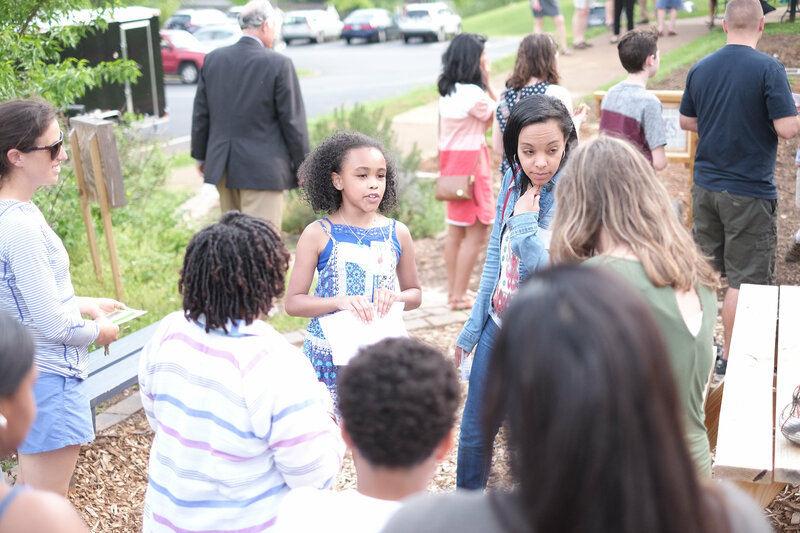 The kids were ecstatic to see their favorite teachers honored, and it was a reminder to us at CSG about how much the program has grown, and how important the cooperation of our educator friends and allies is to the experience. Also receiving Golden Trowel that night were our outstanding partners and donors, without whom the uphill battle of expanding garden education would be impossible. CSG is grateful for the partnership of Sarad Davenport at the City of Promise and the Todd Niemeier at the Urban Agriculture Collective of Charlottesville, who do amazing work in their own right. Without John Mann of Charlottesville Parks and Rec and his crew, maintaining the gardens would be a herculean effort. Beth Cheuk at Charlottesville City Schools was also recognized for her ongoing support. Root! was a chance to recognize them, as well as the other invaluable community partners who share in our mission. You can see the full list of awardees here. The other award that CSG gives out is the Golden Beet Award, recognizing superlative team service by our many volunteers. This year, two teams rose to the challenge of long-term, involved volunteering. The Piedmont Master Gardeners received a Golden Beet for their continued involvement in the Jackson-Via Garden Club. Mary Voorhees, who hosts the club, was recognized for her service both through PMG and on her own. Similarly dedicated is Alex Whisnant, a former intern of ours whom we awarded for his service through the Alpha Phi Omega service fraternity. Alex volunteered with APO and on his own, contributing to large-scale garden projects throughout the past year. The sweetest part of the night, however, goes to Burnley-Moran Safety Patrol Students who came out to give tours of their garden. Each student was so dedicated and knowledgable and with enthusiasm guided our guests through the many unique habitats they nurture including the permaculture gardens, butterfly habitat, bug mansion and more. & Lincoln Shaw. Thanks to Rebecca Baber, BME Guidance Counselor who organized the Garden Tour Guides. 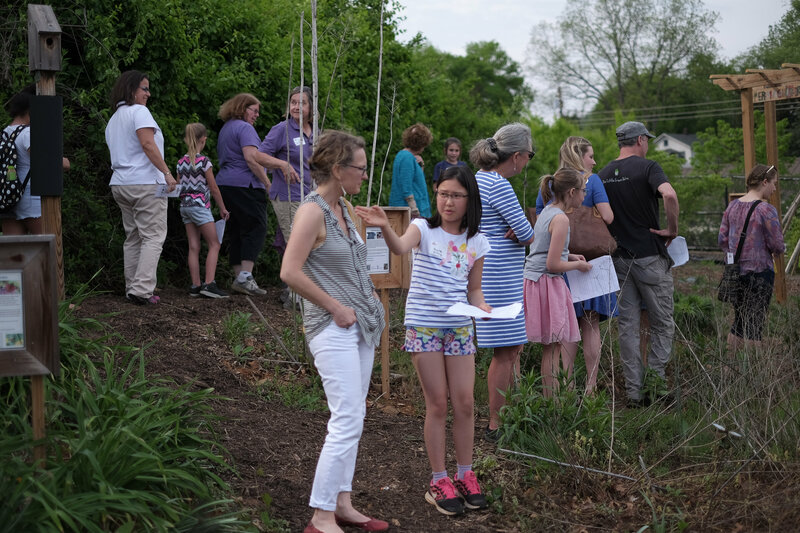 City Schoolyard Garden’s mission is one of community engagement and improvement, which is impossible without the input of individuals and organizations that are members of that community. It’s vital to recognize the diversity of voices, backgrounds, and types of labor that come together in the garden. We are a city of planners, builders, and maintainers, of teachers, students, and administrators, of scientists, writers, and activists. 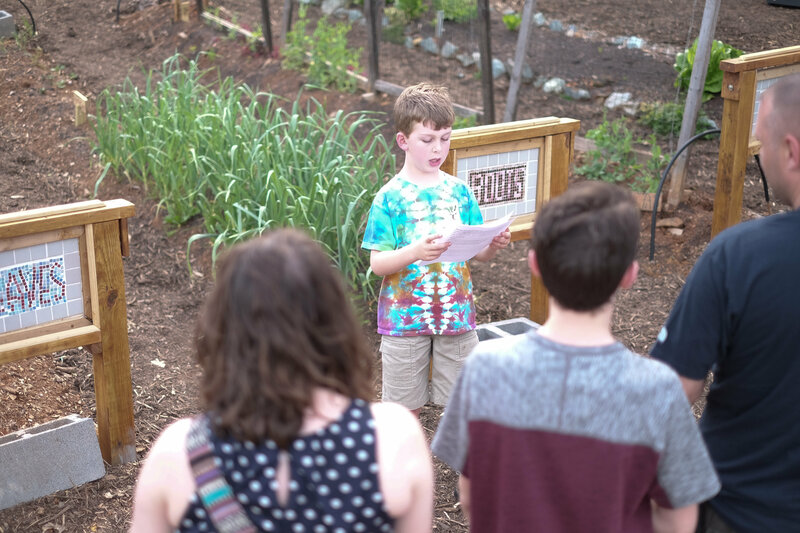 All of this is important to the work that City Schoolyard Garden does, and we hope these awards are felt tenderly by their recipients, who deserve them more than words can express. Dear Friends, Good job of winning the award! I am proud of all of you. The best thing I liked was when we went on the nature walk. I like when we planted the apple tree too. Love, Amiya.